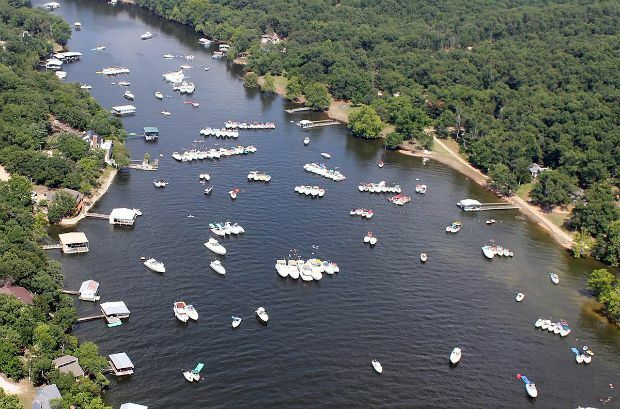 Langley – A July 4 fatality on Grand Lake – being investigated as a possible carbon monoxide (CO) poisoning – is prompting the Grand River Dam Authority to share more information about CO, the “station wagon” effect and the possible dangers it can present to boaters. Edwards said the death of Myron Posivak (42, Arizona) on Grand Lake on July 4 has been attributed to CO poisoning. In that incident, five other passengers on the same boat with Posivak were also made sick. CO that builds up in the air space below the stern deck or around the swim deck can prove deadly, within a few seconds of exposure. Boats traveling at slow speeds, or idling in the water, can cause CO to build up in the cabin, cockpit, bridge, aft deck or even open areas of the boat. Wind blowing in from the back of the boat can also increase the chances of a CO buildup. Boats operating at a high bow angle, or boats that are improperly or heavily loaded, or boats with an opening that draws in exhaust, can also lead to CO buildup. Install approved, battery operated [easyazon_link identifier=”B001JBQEKY” locale=”US” tag=”myfamanc-20″]CO detectors[/easyazon_link] in each accommodation area of your boat. Test them before each trip out. Properly install and maintain all fuel-burning engines and appliances on your boat. Have your boat’s engine and exhaust systems maintained and inspected on a regular basis by experienced and trained mechanics. Even in inclement weather, keep forward facing hatches open to allow fresh air to circulate in accommodation spaces. When possible, operate the boat so that prevailing winds will help dissipate exhaust. Never block exhaust outlets. Blocking outlets can cause CO to build up in the cabin and cockpit areas, even when hatches, windows, portholes and doors are closed. Dock, beach or anchor your boat at least 20 feet from the nearest boat that is a running a generator or engine. Exhaust form a nearby vessel can send CO into the cabin or cockpit of a boat. Remember, CO cannot be seen or smelled. If anyone has these symptoms, move them to fresh air immediately and investigate the cause and take corrective action. Seek medical attention if necessary. “Taking these precautions and educating yourself on the facts of carbon monoxide and boating can go a long way in helping to keep boaters safe,” said Edwards. He added that the public can also find even more information about CO and boating on the United States Coast Guard’s boating information site, uscgboating.org. Also, the Centers for Disease Control and Prevention website, cdc.gov, has a link with more information. Links to both sites can also be found on grda.com. The good news is, virtually all carbon monoxide poisoning incidents while boating are preventable. GRDA is sharing the facts so boaters can educate themselves and take precautions before heading out on the water.